NFL week 10 preview: Remember the last time Amari Cooper played the Eagles? 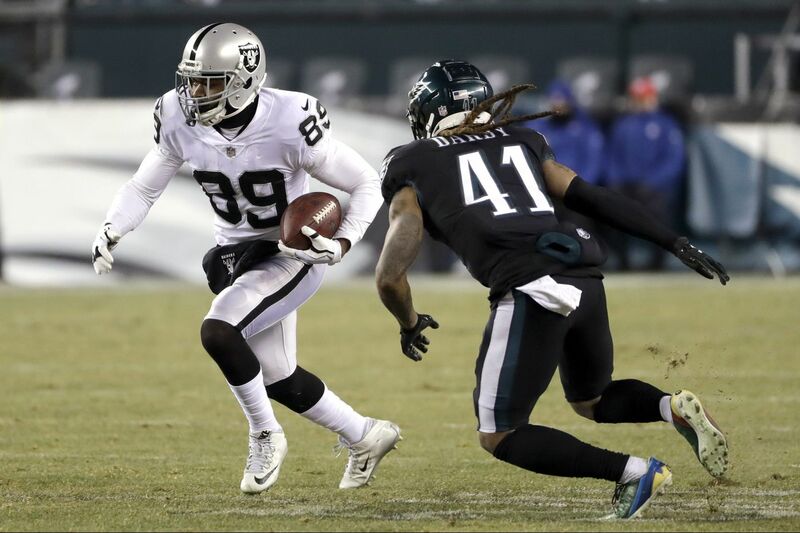 It wasn’t this play, but it’s still memorable: Amari Cooper (left) burned the Eagles for a 63-yard touchdown on a slant-and-go while with Oakland last Christmas night at Lincoln Financial Field. New Cowboys wide receiver Amari Cooper burned Jalen Mills for a 63-yard touchdown on a slant-and-go while with Oakland last Christmas night at Lincoln Financial Field. Golden Tate, the Eagles' newest receiver, tattooed the Cowboys for two touchdowns for Detroit in Week 4. Dallas has given up the most sacks per pass attempt in the league. The Eagles are 11th. This will be the 12th consecutive year an Eagles-Cowboys game is on a Sunday night, but the first in Philadelphia since 2014. Line: Eagles by 7. New Orleans (7-1) at Cincinnati (5-3), 1 p.m. The Bengals defense is trying to avoid becoming the first defense ever to allow 500 yards in three consecutive games. And the reason they haven't already set this dubious mark is because Pittsburgh had only 481 before K.C. 's 551 and Tampa's 576. A date with Drew Brees is not what they need. The Saints have won seven in a row, but they have the league's 31st-ranked pass defense. Only Cincy's is worse. Bengals star wide receiver A.J. Green is out indefinitely with a toe injury. Line: Saints by 5. If it wasn't a divisional game, the Rams might also be susceptible to a trap game. L.A. will host Kansas City next week. Todd Gurley has scored 16 touchdowns, which is more than that of seven other offenses (including Dallas). The Seahawks nearly upset the Rams in Week 5, when they ran for 190 yards in a 33-31 loss. Gurley had three rushing touchdowns to help the Rams, 7.5-point favorites that day, escape with the win. Line: Rams by 10. What Todd Gurley has done the last 2 seasons is truly historic. He leads NFL in scrimmage yards (1,230) and scrimmage TDs (16), as he did in 2017. Only other players since 1932 to lead NFL in both in consecutive seasons: Jim Brown (1958-1959) and Don Hutson (1941-1942). Tom Brady (576) needs four touchdown passes to pass Peyton Manning for the most all-time, including the postseason. It's also the 300th career game for Brady. Manning played in 293. This will be Malcolm Butler's first game against Bill Belichick, who benched Butler moments before last year's Super Bowl. Butler, who signed with Tennessee in March, did not have a good first half of the season. Pro Football Focus says his 618 yards and seven TD passes are the most allowed by a corner. Line: Patriots by 7. Postgame headline: Hey, anybody seen Gronk? Miami (5-4) at Green Bay (3-4-1), 4:25 p.m. The Packers, with Aaron Rodgers, have a losing record. The Dolphins, with Brock Osweiler and Ryan Tannehill, have a winning one. Tannehill (shoulder) is out again. Miami will need to run the ball to stay in the game and keep Rodgers on the sideline. In last week's win over the Jets, the Dolphins ran Frank Gore 20 times and Kenyan Drake three. Miami leads the league with 15 interceptions. Rodgers has thrown one in 327 attempts. Line: Packers by 9.5. The Buccaneers, who have lost five of six since beating the Eagles, could do the Birds a favor with a win here. Former Eagle DeSean Jackson, who also played three seasons in Washington, has one touchdown in the last six weeks and has been held under 50 receiving yards three times. He asked to be traded a couple of weeks ago, but Tampa Bay's brass did not oblige. Washington, already missing left tackle Trent Williams, placed guards Shawn Lauvao and Brandon Scherff on injured reserve and signed three O-linemen off the street. Line: Buccaneers by 3. Detroit (3-5) at Chicago (5-3), 1 p.m. The Lions have won nine of the last 10 in this series. Detroit gave up 10 sacks last week and will face a Bears defense welcoming back Khalil Mack, who missed the last two weeks with an ankle injury. Line: Bears by 6.5. Atlanta (4-4) at Cleveland (2-6-1), 1 p.m.
Cleveland lost defensive leader Christian Kirksey for the season with a left hamstring injury, a player fellow linebacker Joe Schobert called "the heart and soul of the defense." That defense was decent early on but has been trash over the last month, slipping to 28th in points and 30th in yards allowed. Line: Falcons by 5. L.A. Chargers (6-2) at Oakland (1-7), 4:05 p.m. The Raiders have lost four in a row and have scored just 44 points in those losses. San Diego has won five in a row and Philip Rivers (19 TDs, 3 picks) is playing the best football of his 15-year career. Oakland is last in the league in rushing defense but held the Chargers' Melvin Gordon to 58 yards on 19 carries in Week 5. Line: Chargers by 10. Postgame headline: Raiders change longtime slogan to "Just compete, baby"
Arizona (2-6) at Kansas City (8-1), 1 p.m. Most lopsided game on the board as far as the point spread. The Cardinals' money line is as high as 12-1. Chiefs quarterback Patrick Mahomes can join Steve Young as the only quarterbacks with 300 yards and three touchdowns in five straight. Opposing quarterbacks, however, have just eight TD passes against Arizona, fewest in the league. Line: Chiefs by 16.5. Jacksonville (3-5) at Indianapolis (3-5), 1 p.m. Both teams are coming off a bye. The Jags are on a four-game losing streak and are calling this a must-win game. Their last loss was to the Eagles in London. Jaguars cornerback A.J. Bouye (calf) will not play, but star running back Leonard Fournette will. Fournette (hamstring) has been absent for most of the season and the Jags offense has wilted. The Colts need one win to equal last season's total. A strong second half would put Andrew Luck into the conversation for comeback player of the year. Line: Colts by 3. So much for those improved TV ratings. New 49ers quarterback Nick Mullens attended the prestigious Manning Passing Academy two years ago. Now he gets to face Eli Manning, whose Giants career is standing on a banana peel. New York running back Saquon Barkley leads the league with 491 yards after catch. San Francisco tight end George Kittle (407) is tied for second. Would not have guessed that. Line: 49ers by 3. Buffalo (2-7) at N.Y. Jets (3-6), 1 p.m. This could be a fun game some day if Josh Allen and Sam Darnold develop into solid quarterbacks. Today is not that day, so it looks like Nathan Peterman vs. Josh McCown. Wouldn't be surprised if CBS televises a western instead. Line: Jets by 7. Postgame headline: "Bills Mafia" fan-base changes its name to "La Cosa Nogood"